There is no denying the sense of adventure and joy one feels while travelling with a trailer or a campervan hitched to the vehicle. It is an unadulterated experience. To ensure that journey remains accident free, there are certain tow bar regulations and rules that must be followed to tow you trailer in Australia. A load must not project more than 15 cm beyond the trailer’s width, or be more than 2.5 wide overall – whichever is less. Trailer loads that project more than 1.2m behind a trailer must have a red flag attached to the end of the load. This flag must be at least 30cm square and be clearly visible to other road users. To avoid having an overhanging load, you should use a trailer that suitably contains the load being transported. When driving in between sunset and sunrise, or any other instance of insufficient daylight, a clear red light (or at least two red reflectors) must be fixed to the end of any projecting load. The overall length of the vehicle and trailer(s) combination, including its load, must not be more than 19m. Loads should be kept at low and as close as possible to the axle(s), with about 60 per cent of the total load weight forward of the centre of the axle(s). As a general rule, about 5 to 10 per cent of the GTM should be supported by the vehicle through the coupling. The trailer drawbar should be level or slightly ‘nose down’ to the tow bar. A vehicle may tow a laden trailer of up to 1.5 times the unladen mass of the tow vehicle, provided that the tow bar is rated accordingly and the trailer is fitted with brakes that comply with the requirements stipulated in the Australian Design Rule ADR38. If the trailer is not fitted with brakes, then the maximum mass must not exceed the unladen mass of the motor vehicle. The unladen mass of the vehicle can be found in the vehicle’s handbook, or check with your car dealer. All trailers with a gross trailer mass (GTM) that exceeds 750 kg must have brakes. Following the rules and regulations ensures that you have a safe drive. 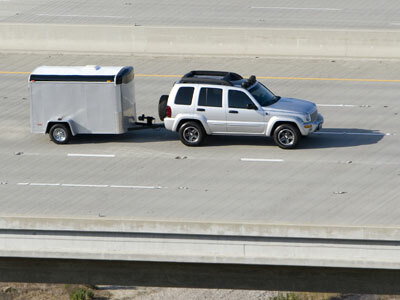 Hauling a trailer across the highway may seem like an easy ride, but it can very easily go wrong if no attention is paid to the safety of the trailer and the vehicle. For more information on the rules and regulations involved with towing in Australia, don’t hesitate to contact one of our experts.